1 Finely chop the onion. Peel the celeriac and dice into 1cm cubes. Trim and slice the celery. Strip the leaves from the lemon thyme. Roughly chop the walnut pieces. 2 Heat the oil in a large saucepan over a high heat. Add the prepared vegetables and fennel seeds then cover and cook gently for 5 minutes. Stir in the lemon thyme and the stock and bring to the boil. Cover and cook for 20 minutes. 3 Add the milk to the soup with half of the walnuts and blend until smooth, in batches if necessary. Season to taste and reheat. 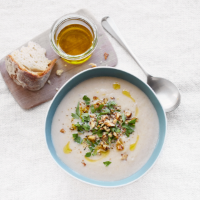 Ladle into bowls and scatter over the remaining walnuts and lemon thyme leaves. Garnish with the zest, parsley and olive oil, if using.